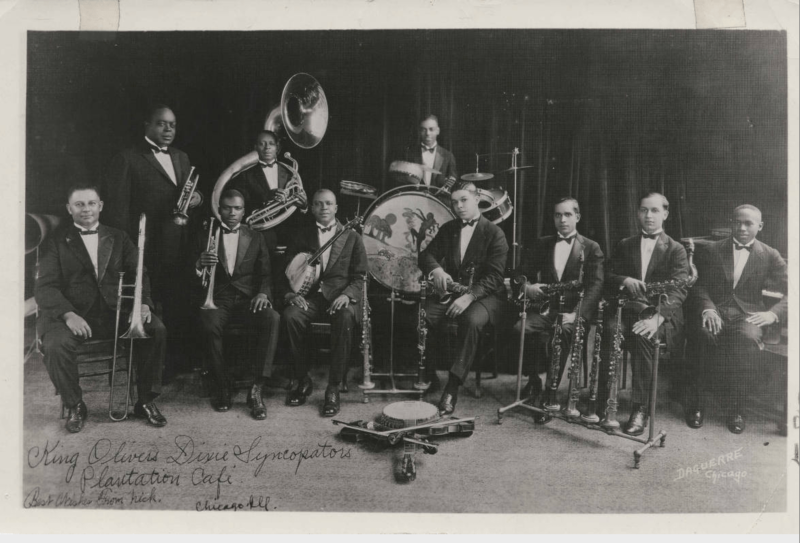 King Oliver’s Dixie Syncopaters, (l-r) George Filhe, Bert Cobb, Bud Scott, Paul Barbarin, Darnell Howard, Joe Oliver, Albert Nicholas, Bob Schoffner,Barney Bigard and Luis Russell. This is a great photo, shot at the Plantation Cafe’ in Chicago, in 1925. It shows the talent that drained out of the New Orleans music scene because of the harassment these men received at the hands of white folks in the Jim Crow South. Oliver was a mentor to Louis Armstrong, and encouraged Pops to get on the train and join him in Chicago. Many of these men left New Orleans and never looked back, or only did so in the late 1960s, a combination of the Civil Rights Act of 1964 ending Jim Crow and Preservation Hall opening.